In this ride we follow along with local pro Eric Landis starting and ending at the lower parking lot linking together a series of the locals favorite trails in the "right" direction for an hour of sheer entertainment. 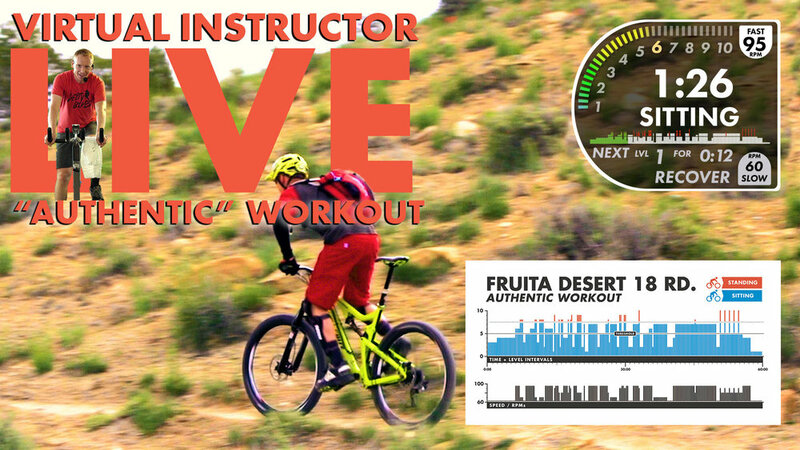 With super dynamic steep punchy climbs, long sit and spin efforts and full recovery down hill segments you can ride along for an authentic Fruita, Colorado mountain biking experience. A custom "Heads Up Display" and cadence matched original music soundtrack allows you to pedal to the beat to drive your workout like never before! Short high power intervals engineered to develop strength & acceleration. 2 Sets of 4 repeating twice with plenty of recovery for quality power reps! Medium length engineered intervals useful for real world trail riding. Sets of 4 with increasing intensity while shortening duration & recovery. Longer intervals to challenge endurance while still being ready to attack! Not much recovery will force you to hold on with all you are worth. Our most popular "Authentic" workout is as random as the trail itself. Grueling climbs & out of the seat sprinting will make the hour fly by. Featuring a live virtual instructor!